If you ever come across people who take a great interest in martial arts you may notice that they regard it not just as a kind of physical activity and a way to stay healthy. They think of it as a lifestyle. All kinds of martial arts reflect the historical and spiritual aspects of the progress of society it was created by. The Kadochnikov System doesn’t make exclusion. Suffice it to say that the System is based on a great philosophical constituent. People involved in this System don’t refer it to the martial arts. They consider it as a lifestyle, a notion much wider than a simple variation of hand-to hand combat. Alexey Alexeevich Kadochnikov himself points out that his system is not just a type of a hand-to-hand combat or some kind of martial arts; this is the private safeguarding technique, meaning the skills that allow a person to survive or solve a problem in any situation. In this entry I’d like to discuss the following question – what allows us to regard the Kadochnikov System as something more than just a martial art? What is it if it’s not a simple system of hand-to-hand combat? Let’s start with discussing the one of the main postulates of the Kadochnikov System: the trinity of forces – physical, spiritual, intellectual. This concept is very deep. The trinity describes all the processes in human activity. Assume we do something and we lack one of the components: physical, spiritual or intellectual, you can hardly predict the result. On the other hand joining spirit, body and knowledge we get complex training which we can use not only in the fight. I’d like to bring up several principles the Kadochnikov System is based on. And I’ll start with my favorite one — the method from the contrary. In practice itlies in the following. First a man slowly takes the blow. After this he starts to adjust to it and find the way to take the hit to the components and extinguish its negative impact. The method from the contrary should be used not only in the Kadochnikov System but also in all the other spheres of human activity. This is the perfect way to define goals. Starting with the eventual result we want to get we can distinguish the sequence of steps on our way to it. Thus we can work out the plan. And what if have no vision of the final point and we don’t know what we want to get? Are we going to make it? No! There are no wonders. You should work to attain the aim; and how can you work if you don’t now what you actually want to get? You may object that all I’ve said is obvious. May be you’re right. But you should admit that too few people actually follow this rule. Those who read the stories about Sherlock Holmes may recall how Dr. Watson was astonished at the detective’s ignorance about elementary things about this world. Mr. Holmes answered that he had no need to litter his mind with useless things. The same happens with us: we may know a lot of things but abstract and useless missing all the necessary information. We’ve just discussed only one principle and in the Kadochnikov System there are hundreds of them! The deeper you go the more ties you find that actually work. The people who joined the Kadochnikov System very often say that they had a feeling as if at a certain moment their heads started to work properly and they started to wake up. The knowledge and skills people get from the Kadochnikov System are very useful and can be applied in all spheres of life. For instance I like to make an analogy between the principles of the System and the ones used in business. It is provided to be that the truth is the only one but there are many ways to reach it. The Kadochnokov System is a synthesis of useful and efficient knowledge that people need to live in the contemporary world. Every movement in this System is done for a certain purpose. I like repeating that the System is counter-intuitive. When you’re attacked your first impulse is to step away from the hit. 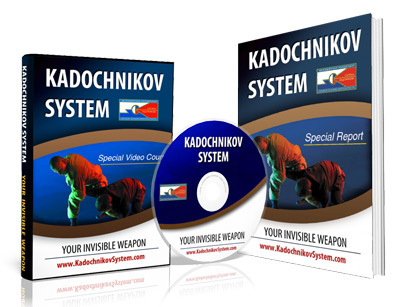 The Kadochnikov System on the contrary teaches you how to take the blow and how to get close to your opponent. This is vital for an effective work. If you were seized your first urge is to get away and break the contact. According to the System you should keep contact by all means. I can make a lot more examples. And the more parallels I make the more I prove it that the Kadochnikov System is really a lifestyle. A man who gets absorbed in the System starts to act in accordance with its principles. 1. First, the Kadochnikov System is based on the science, the laws of physics and mechanics and the synthesis of the scientific knowledge of the humanity. In other words there is no magic or some notions that an ordinary man can’t understand. 2. Second, you use only quarter of you efforts. The Kadochnikov System teaches you to solve the given problem using only 25% of your strength. It allows a weak, injured, exhausted or physically weak person to solve the problem and survive. It wonderfully goes with the Pareto principle or with the 80/20 rule which implies that 20% of activity brings 80% of the result. 3. Third, the simplicity and accessibility. I know cases when a person who attended several lectures could save his life due to this knowledge. I strongly advise you to read the story of an amazing man Oleg Viktorovich Ufimcev. 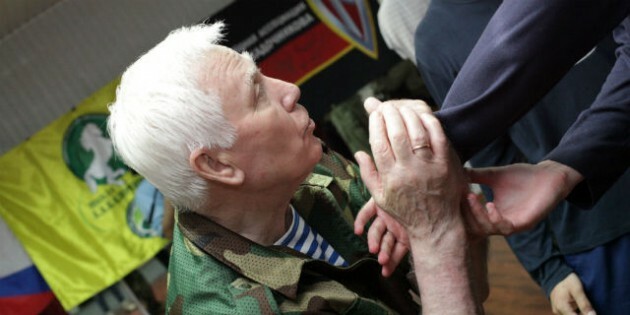 He believes that the Kadochnikov System saved his life in Chechnya. There are a lot of entries before us and we’ll gradually discuss various points concerning the private safeguarding technique of a man in 21st century. Meantime I’d like to bring up my favorite utterance I’ve heard from Alexey Alexeevich Kadochnikov – Understanding the process is above the knowledge itself. Please think it over. Very interesting, will their be articles on the spiritual dimension as well?